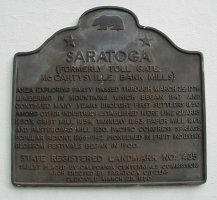 The Anza exploring party passed through the Saratoga area March 25, 1776. Lumbering in the mountains, which began in 1847 and continued many years, brought the area's first settlers in 1850. Among other industries established were a lime quarry (1850s), grist mill (1854), tannery (1863), paper mill (1868), and paste-board mill (1870). 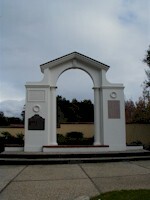 Pacific Congress Springs was a popular resort from 1866 to 1942. Farmers here pioneered in fruit industry and held Blossom Festivals beginning in 1900, after the end of a drought.